Hina Khan, Luv Tyagi and Akash Dadlani voted for Priyank. On the other hand, Arshi, Vikas and Puneesh voted for Hiten. At last, everything was in Shilpa’s hands; her vote changed the game altogether. 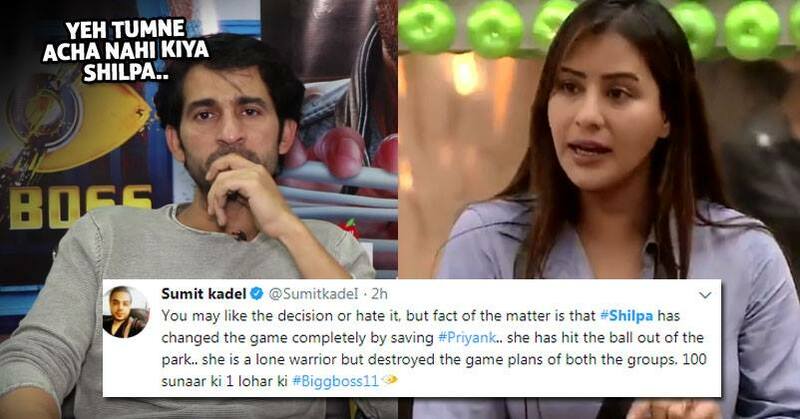 Unfortunately, she took the most unexpected decision of saving Priyank. We all had thought that she would choose Hiten over Priyank, but she did exactly the opposite. Priyank had already called Shilpa a “Saand”, so, people didn’t understand as to what made her choose him. In last night’s episode, we got to see a different side of Shilpa altogether. Even Hiten said that Shilpa voted him out as he was a strong contestant and she wanted to decrease the competition. Many people were furious over this decision of Shilpa, but there were some who gave the title of “MASTERMIND” to Shilpa. She’s here to play a game and of course, she will do everything to keep herself safe. She voted out Hiten and further weakened Vikas Gupta’s side, who is her tough competitor. The best part when gauri said to vikas dont use ur mastermind and get rid of hiten.this is what happened. Anyways hina & shilpa is very strong contenders.shilpa played very smartly buy kicking out hiten out .game mean sab kuch hota hai. What do you have to say about this? Was her decision right?